SINGAPORE - Singapore's services industries saw revenue growth across the board in the third quarter, according to figures released on Tuesday (Nov 27) by the Department of Statistics. Turnover for the sector was up by 8 per cent on the same period the previous year. The pace of growth picked up from the second quarter, where growth was revised downwards by a smidgen to 7.7 per cent, from an earlier figure of 7.8 per cent. The index does not take into account wholesale and retail trade, accommodation or food services. Growth was led by the information and communications services industry, which saw revenue rise by 11.3 per cent on higher receipts from computer programming and consultancy firms, as well as activities such as Web hosting and Web portal services. Financial and insurance services notched 10.6 per cent growth in revenue, beating the previous quarter's 10.4 per cent increase, while education services raked in 9.7 per cent more than in the previous year, compared with 4.5 per cent in the quarter prior. Business services - which include real estate, legal and accounting work, travel agencies and security services - posted a 6.3 per cent growth, slower than the previous quarter's 7.6 per cent improvement. Health and social services turnover was up by 5.5 per cent for the quarter, declining from the 7.2 per cent growth in the second quarter. But the 6.2 per cent growth in recreation and personal services was a turnaround from the 3.3 per cent year-on-year slide seen in the previous quarter, while transport and storage receipts saw an improved 5.6 per cent growth, from 3.9 per cent previously. On a quarter-on-quarter, non-seasonally adjusted basis, the services sector was up by 2 per cent. 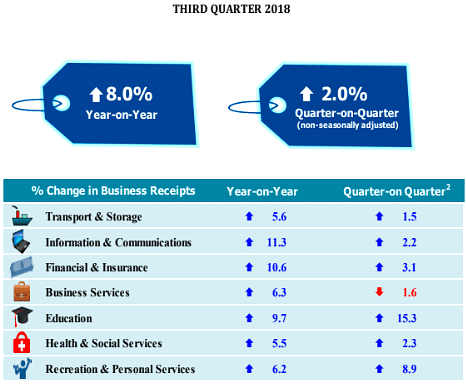 Business services dragged the sector down, with a 1.6 per cent decline in receipts, no thanks to lower contributions from accounting, architectural and engineering services. Still, education services pulled in 15.3 per cent more, on the back of a payment cycle that sees higher education institutions collecting more fees in the first and third quarters of the year. Turnover from the recreation and personal services industry grew by 8.9 per cent, fuelled by receipts in the attractions segment - a steep reversal of the 10 per cent quarter-on-quarter slide that was recorded between the first and second quarters.